Interested in teaching a workshop? Contact us with information about your workshop, whether you will need any special equipment, or if there are any supply fees that attendees will need to know about. To view times for these workshops, go to our online schedule. Do you like to advocate your beliefs in a forceful, but calm and respectful way? Do you like to blow others’ minds with cogent and well-reasoned arguments? Then this workshop might be for you. There may be occasions when we, as Pagans, find it necessary to advocate for our spiritual path to the larger world. 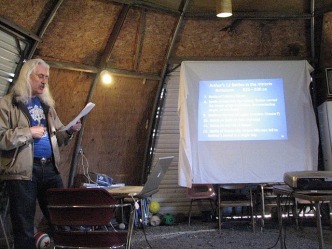 This workshop will discuss in what situations to advocate, and perhaps equally importantly, in what situations not to advocate; the various critiques of Paganism one might encounter in contemporary society; lines of argument that one might take to counter these critiques; and the importance of arguing for something, rather than simply against other’s positions. It will also discuss the power of living examples as an under appreciated form of religious argument. This workshop will be presented from inside the theological construct of ADF orthopraxy, but will contain ideas that can be applied to other pagan paths as well. This workshop will present a round table discussion with several thoughtful ADF priests and non-priests about the past, present, and future of the ADF priesthood. It will examine such questions as: what is the purpose of the priesthood, how has it evolved over time, and what is its future, among others. Please bring your own questions for the round table. No question is off the table, as long as it is posed in a respectful fashion with noble intent. So if you have ever wondered, what is the deal with those people dressed all in white with the colorful stoles, then this is the workshop for you. We hope to see you there. This workshop will explore energy work and its correlations with physics, spirituality, and martial arts. No experience necessary. Linda is Senior Druid of Three Branch River Grove since 2016. She has a solid grounding in herbalism and has practiced energy work and healing for years. You are invited to join us for a threefold workshop: a discussion of benefits that are possible through relationships with nature, a chance to learn and refresh nature connection techniques, and a brief opportunity to engage with beings and energies of the sacred landscape. A look at the dire circumstances of our environment will be included in the discussion about reasons for doing the work, and a diverse set of methods (observational, conversational, shamanic, alchemical, energetic, artistic, and more) will be covered in the technique discussion. And, there will be an after-workshop session for those who wish to continue to work. All backgrounds and experience levels are welcome. Adam M. Davis is pledged in service to the people of the land. He teaches about the Earth as a system of connected energy movements in classrooms and in the field, and he facilitates spiritually oriented “Connecting with the Land” workshops at healthy living fairs, community events, and various other types of gatherings. Adam enjoys combining multiple perspectives and techniques to explore holistic ways of working with nature. He is devoted to teaching diverse groups of people about the Earth and helping them connect with its energies. The “Connecting with the Land” workshops that Adam facilitates create an intellectual and energetic environment that allows participants to enhance their awareness of the sacred aspects of place and develop nature connections. See our website for more information about the Connecting with the Land Workshop Series as well as links to deep ecology references, and visit us on Facebook (http://www.facebook.com/ConnectingWithTheLand/) for news of upcoming events, nature photographs, and related information. Also, a list of techniques that get used during workshops can be found here. At Connecting with the Land Workshop Series events, diverse people come together in reverence and respect for nature and each other. Learn the tried and true methods for marketing your group or event to increase exposure, participation, and authority. What ways are cost-effective for lower budgets, and how can you effectively use social media and pay-per-click ads to build your audience effectively? You will take home a list of tips and tricks to try as well as software and apps that can help you along the way. Donald Smith is a co-founder of Copper Kettle Farms based out of Gettysburg, PA. He grows and cultivates various heirloom vegetables and garden-friendly flowers while building a permaculture food forest that integrates with his various chicken breeds. His work with the land is built around bringing back older, more efficient methods of farming and gardening that heal the Earth rather than strip it. He is a member of the Naturalists Guild of ADF, Hallowed Ground protogrove, ADF, and Great Valley Kindred. As an Anglo-Saxon Heathen, his work with the land is part of his dedicated service to Ing. In this workshop, meant for both potential mentors and potential mentees, we will discuss the progression of the mentoring relationship, practical steps, and skills you can use as a mentor, why you might benefit from being a mentee, and what a healthy mentoring relationship looks like from both perspectives. Rev. Jan Avende has been a member of Ár nDraíocht Féin and Three Cranes Grove, ADF since 2009, where she serves as an Initiate and ADF Consecrated Priest. She is a talented Bard, Liturgist, and Spiritworker, who is active as an officer and member in many of ADFs subgroups. She uses her talents as a certified teacher to aid in mentoring folk, building resources for pagan families and making the details of Our Druidry more accessible to all.